It’s all over but the shouting for Selina. Although it is not “cancelled,” HBO has confirmed that its Veep TV show will end after season seven. Despite a significant ratings drop in the sixth season, which ran from April to June 2017, HBO renewed Veep for its seventh and final season, on June 27, 2017. An HBO comedy series, Veep stars Julia Louis-Dreyfus, Anna Chlumsky, Tony Hale, Reid Scott, Timothy Simons, Matt Walsh, Sufe Bradshaw, Kevin Dunn, Gary Cole, and Sam Richardson. In season six, just a year after losing the presidency, Selina struggles to shore up her legacy. Dan (Scott) attempts to make a good impression at his new job. Meanwhile, Amy’s (Chlumsky) new co-workers find her D.C. attitude hard to take. 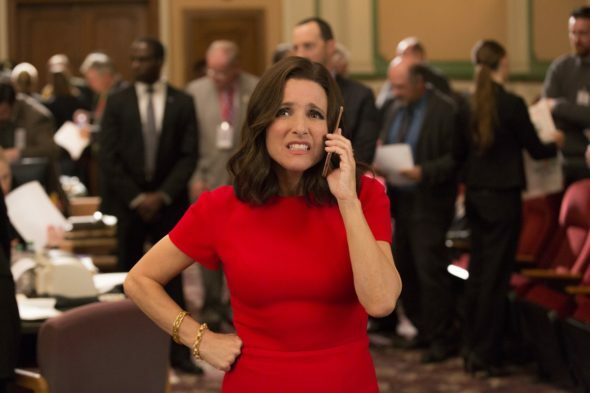 The sixth season of Veep averaged a 0.23 rating in the 18-49 demographic and 584,000 viewers. Compared to season five, that’s down by 50% and down by 41%, respectively. Learn how Veep stacks up against the other HBO TV shows. ‘The decision to bring Veep to a close at the end of next season is bittersweet’, HBO President of Programming Casey Bloys said in a statement. ‘We love the show and everyone involved but respect the producers’ choice to bring Selina Meyer’s journey to its conclusion after an extraordinary run of critical and award-winning acclaim. Julia Louis-Dreyfus’ comedic brilliance infused Selina with a dynamic presence and a vibrant wit which will ensure her a place in the history of television’s most iconic comedic characters. We look forward to producing the seventh and final season’. The decision was not unexpected. The original cast, whose deals ended after Season 6, only signed one-year contracts to return for Season 7, raising speculation that it would be the show’s final chaptter [sic]. What do you think? Are you still watching the Veep TV series? Do you think season seven is a good time to end it, or do you wish this HBO TV show would have a longer run? Let us know, below. I love the show I am sad to see it go but it had a great run.